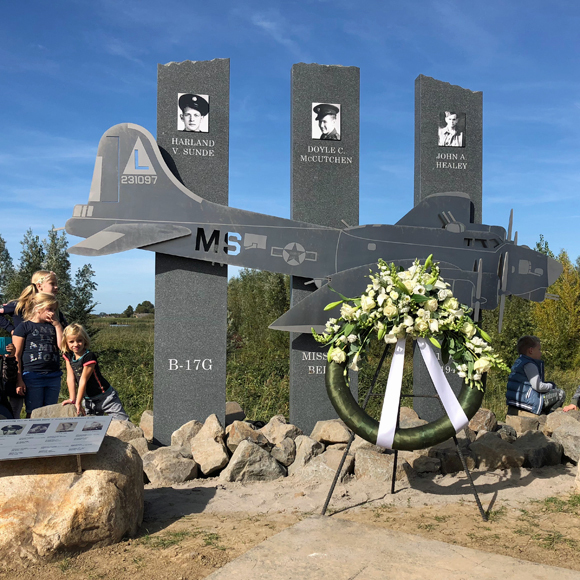 On a recent trip to Holland, we participated in the unveiling of a memorial to the Mission Belle, an American B17G that was shot down near Rotterdam on December 1, 1943 after a mission to bomb war materials factories in Germany. The Mission Belle was part of the famous 8th Air Force. Half the U.S. Army Air Force’s casualties in WWII were suffered by the valiant 8th– 26,000 dead, 47,000 wounded. Eighth Air Force personnel were awarded 17 Medals of Honor, as well as 220 Distinguished Service Crosses, 442,000 Air Medals and of course, numerous Purple Hearts. The people of the Netherlands suffered grievously during WWII. Many ferocious battles were fought over and on Dutch and Belgian soil. Toward the end of the war, the Nazis confiscated all the available food so that the Dutch were starving. Allied airlifts of food saved many lives. The Dutch have not forgotten. The memorial to the Mission Belle was created by the people living near the crash site. The good folk of these small villages including Lekkerkerk and Neiw-Lekkerland banded together to pay for and build the monument. 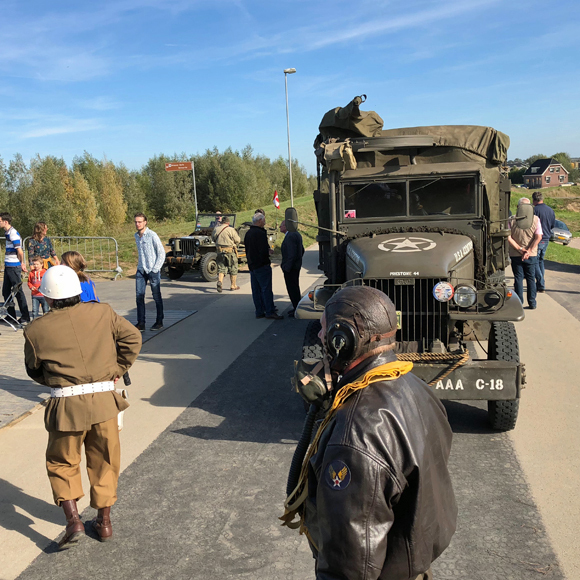 We were invited to the unveiling because my father was the copilot who crash landed the badly shot up B-17 in the River Lek. Two drowned in the crash while Dad and six others survived. The tail gunner had been killed in the battle to shoot down the plane. All the surviving crew were then captured by the Nazis and became prisoners of war. My dad survived 18 months in Stalag Luft 1, near Barth, Germany. The other 6 Americans also spent the rest of the war in prison camp and lived to tell their stories. The ceremonies leading up to and the actual unveiling of this monument to the crew of the Mission Belle were simply amazing. Needless to say, we and the other family members of the crew were treated like royalty– all 36 of us! 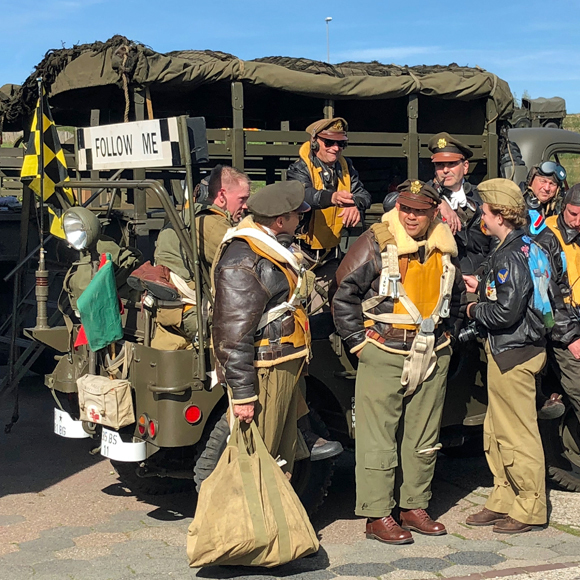 Prior to the ceremony, a group of WWII re-enactors, dressed in period uniforms, recreated the actual briefing for the final flight of the Mission Belle. We were driven to the monument in WWII Jeeps and Trucks where we were greeted by a large cheering crowd! 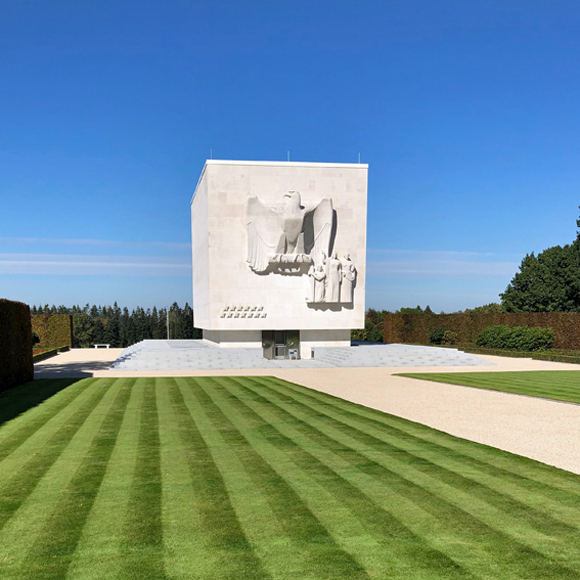 The day after the unveiling, we visited the cemeteries where the 3 who died are buried, two at the Netherlands American Cemetery at Margraten, Netherlands, the other at the Ardenne American Cemetery in Belgium. Our experience was an eye opener. 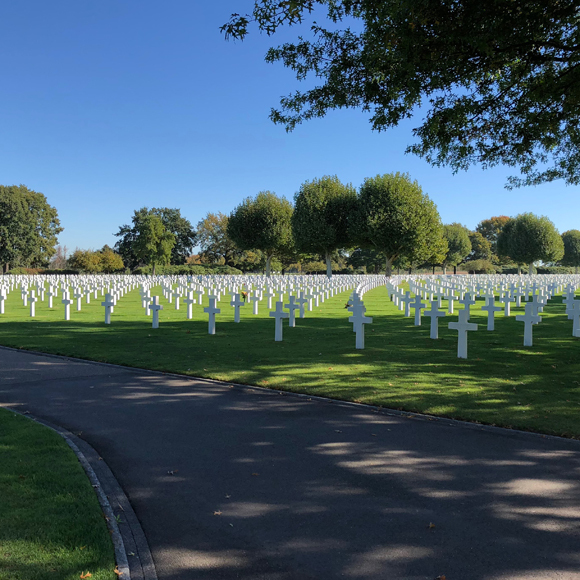 What really struck home and warmed our hearts was how appreciative the Dutch still are of the thousands of Americans who fought and died liberating their country. Thanks to our guys, they have had 75 years of peace. The Dutch take their children to these monuments and teach them that there is a price to pay for freedom. In their words, freedom is not a given thing. On this Veterans Day, Sunday, November 11, please take a moment to reflect on your life, how many good things you enjoy and especially, your own personal freedom – give all of our brave veterans, living and dead, a salute. This entry was posted on Friday, November 9th, 2018 at 4:25 pm	and is filed under Featured Post, Mardon Happenings, Uncategorized. You can follow any responses to this entry through the RSS 2.0 feed. Both comments and pings are currently closed. It has been a true honor and privilege to meet the family and relatives of the men that fought for our freedom. Freedom that’s not a given thing, but too often costs the highest price to be paid.